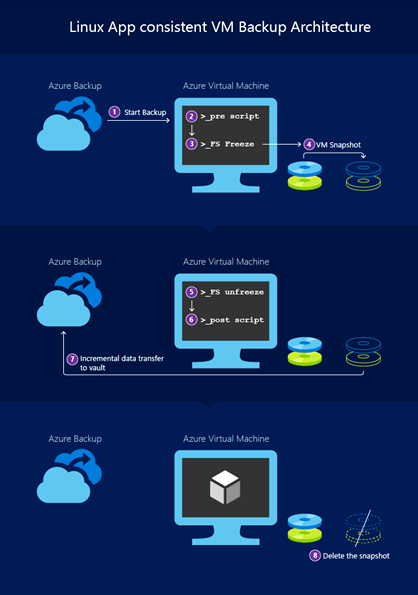 Azure Backup provides file system consistent backup of Linux Virtual Machines running in Azure. Today, we are extending this to take application consistent backups for enterprise critical applications such as MySQL, InterSystems Caché, and SAP HANA running on popular Linux distros (e.g. Ubuntu, Red Hat Enterprise Linux, etc.). This framework gives you flexibility to execute custom pre and post scripts as part of the VM backup process. These scripts can be used to quiesce application IOs while taking backups that guarantee application consistency. You can use the pre-script to quiesce or redirect the application IOs momentarily using application native APIs and flush in memory content to disk before taking the VM snapshot. You can then use the post-script to thaw the IOs post snapshot completion and resume normal application operation. This will ensure application consistent VM backup for any application you are running. Some applications require fsfreeze to be disabled so that it does not interfere with their quiesce logic, so we also provide a capability to disable Linux fsfreeze which is executed by default while taking Linux VM backup using Azure Backup. You can also invoke native application APIs to take application backup and database log backups, and as part of VM backup, data will be moved to Recovery Services Vault, thereby securing it against VM compromise scenarios (e.g. VM deletion or corruption). Application and distro agnostic: The framework is agnostic of Linux distros and versions, and works seamlessly for all supported Linux distros as long as the guest application has APIs to pause and resume application IOs. Sample scripts on github: We are working with partners and ISVs to provide open source scripts on github for popular Linux applications. As of this release, we have these in place for MySQL, Caché, and are working closely with SAP HANA. Below video walks you through various steps on how to configure the framework for executing pre-script and post-script. For more details please refer to the steps to configure application-consistent Linux VM backup. To bootstrap the framework, we worked with InterSystems Caché DB and MySQL DB example with demo scripts, including clustered deployments. You can use this as a reference to create your own scripts and leverage the power of this framework. We are calling for developers, ISVs, tech enthusiasts, and partners to contribute scripts to our open source github repository. The scripts will be available for everyone to use directly or customize based on their requirements. If you are interested in contributing please send a mail to linuxazurebackupteam@service.microsoft.com and we will work with you to publish them on github, explain usage guidelines and ensure that you get acknowledgement for your contribution.